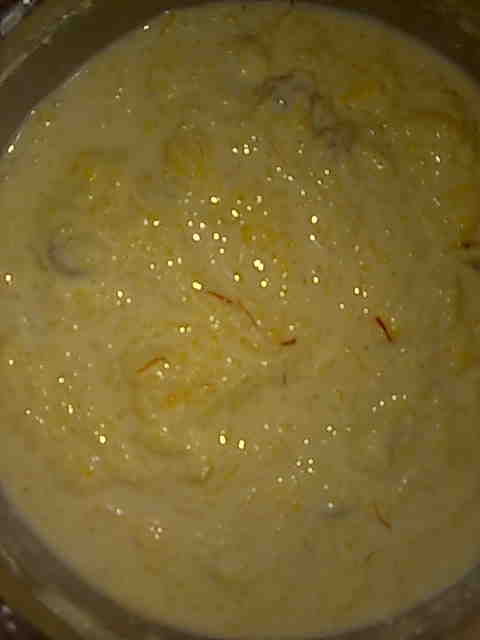 Phirni is a type of kheer (rice pudding). In kheer, you add whole grains of rice to the milk whereas in phirni, ground rice or rice flour is used to make the dessert. Phirni is much quicker to make as compared to kheer but tastes equally good. Soak rice for ½ an hour. Grind to a coarse paste. Blanch pistachios and almonds in hot water. Remove skin and slice. Dissolve saffron in a little hot milk. Boil milk. Dissolve rice paste in a little cold milk and add this to the boiling milk. Stir continuously till the rice is cooked completely. Stirring constantly is important otherwise thick lumps will form which will stick to the bottom of the pan. Add sugar, cardamom powder and saffron. Cook till sugar dissolves. Pour this into earthen bowls and decorate with sliced pistachio and almonds. Refrigerate phirni and serve chilled.